Perrin Gilbert is a metal and woodworking artisan based in Tempe, AZ. Check out Perrin’s work here! 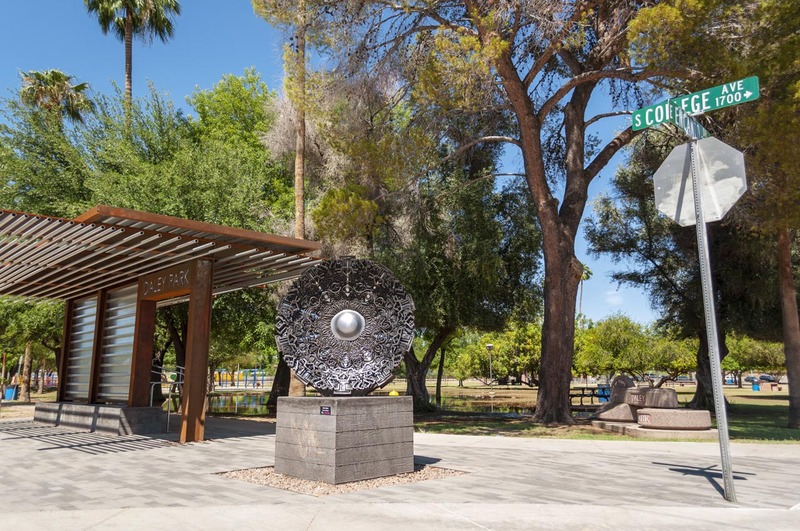 Facing College Avenue from Daley Park, an intricate and monumental sculpture stands as an ode to the desert. Perrin Gilbert was inspired by the beauty and intricacy of Arizona flora set among rough desert terrain. 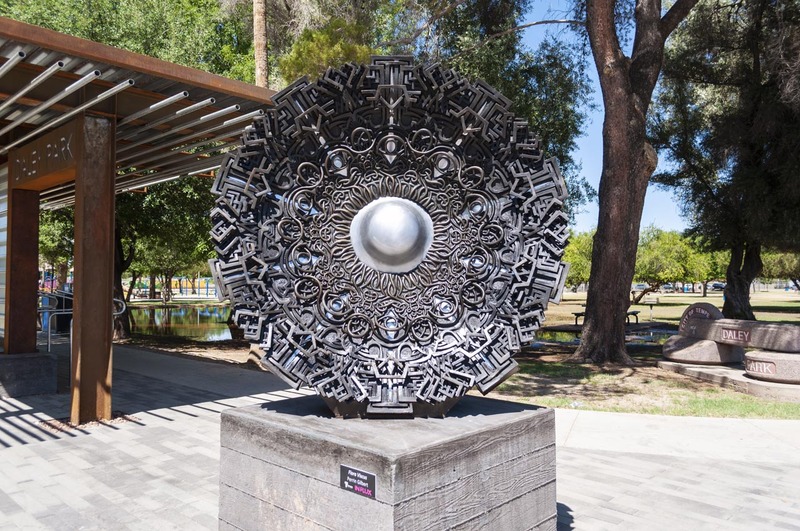 His sculpture uses flowing and organic repeating shapes made from high finished bronze for the face of the flower, set against a simpler and more geometric repeating shape made out of steel. In this way his artwork highlights the contrast of life in a desert city where diverse textures and shapes coexist. Perrin Gilbert received his BFA in Sculpture from Arizona State University. Since graduating, he has been an artisan at the art foundry and fabricator, Bollinger Atelier, for over five years where he assists in the process of mold making and pouring. 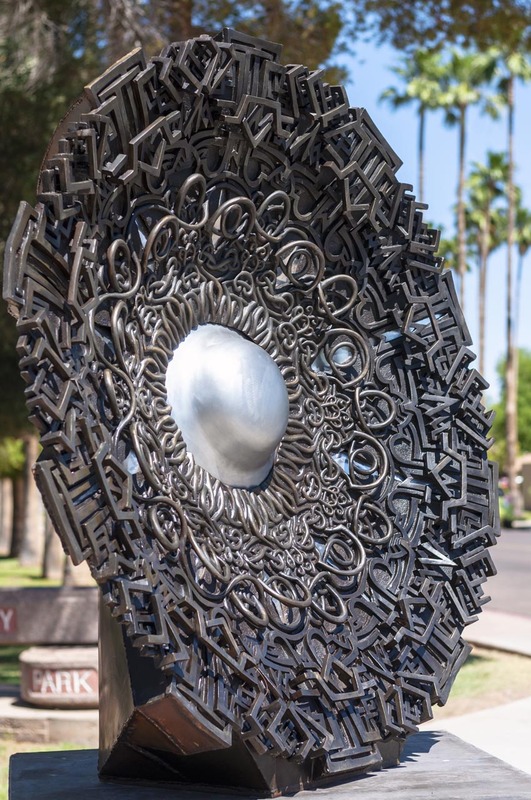 Gilbert has shown his work in multiple exhibitions including the ISC Sculpture Conference at ASU Grant Street Studios, the TCA Juried Biennial at the Tempe Center for the Arts, and the Juried ASU Alumni Show at the Su Vino Winery.